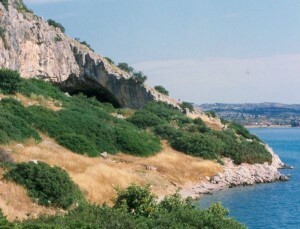 Franchthi Cave is located in northeast Peloponnese in present day Greece. Found from the Early Holocene are fragments of obsidian from the island Melos over 100km away, evidence of hunted red deer, aurochs, pig, and smaller game, as well as the collecting of shellfish, fishing, and intensive gathering of plants. Numerous grindstones were discovered, along with 28,000 seeds recovered from 27 species. The primary species represented were oats, lentils, pistachio, almond, and smaller quantities of barley and various legumes. All seeds discovered were morphologically wild, but it is impossible to judge if they were gathered as wild stands or whether they were tended or cultivated in some way. Through the seventh millenium BC, there was a more intensive, multi-seasonal use of the site, as well as evidence of burials. There was an increased emphasis on shellfish collection and fishing, especially of tunny (the size of which suggests people may have practiced cooperative hunts using watercraft and nets). Around the same time that farmers settled at Knossos, domesticated cereals such as emmer wheat and two-row hulled barley, as well as livestock including sheep and goat appear at Franchthi Cave. There is strong evidence for continuity in the lithic industry and hunting gathering, for example the collection of pistachio, almond, various legumes, and wild grasses continued alongside plant and animal husbandry, which can explain how existing foraging community developed a commitment to husbandry as a component of their subsistence behavior. Barker, Graeme. The Agricultural Revolution in Prehistory: Why did Foragers become Farmers? : Why did Foragers become Farmers?. Oxford University Press, 2006.